3rd Recovery Volunteer Army Training - Open to All - Voices of Hope, Inc. 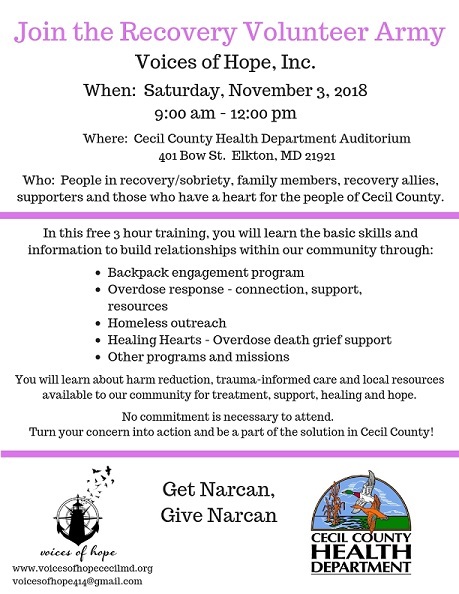 In this free training, you will learn about trauma-informed care, harm reduction and every substance use disorder resource we know about in Cecil County. You will learn about the various forms of available treatment, how it works and where to access it. All known recovery support organizations available will be talked about. Arm yourself to combat addiction in our community by helping people find treatment and recovery support. Narcan training and medication will be available at the conclusion for those interested. You do not have to sign up to volunteer to participate in this education event. All are welcome, no commitment required.